The maiden race of the first ever Swiss TP52 team couldn’t have been any better. MarazziSailing scored a convincing victory, maintaining her lead from start to finish under very tricky and shifty conditions. The team assembled by Swiss Star class champion Flavio Marazzi and German 3-time gold Olympic medalist and two-time America’s Cup winner Jochen Schuemann proved today they have all the credentials to be in the top of their league. The opening day of this year’s AUDI Medcup was marked by long postponements as the hazy and cloudy skies didn’t allow for the breeze to develop. The race committee had to cancel the first attempted race when the breeze completely disappeared halfway through. Race officers were finally able to hold a complete race but the 13-strong TP52 fleet had to sail in a patchy breeze that topped 11 knots. Despite a difficult start, the first ever Swiss team in the TP52 racing circuit perfectly stayed on top of the situation, thanks to a combination of correct tactical calls, well-executed crew work and good steering by Flavio Marazzi. The key to the race was to stay in tune with the shifts that came aplenty. The Swiss boat was squeezed in the start line but a after a few tacks Marazzi steered her to the right side of the course, picking the right shift that put Marazzi Sailing in the lead. Halfway through the first beat, the boat’s afterguard, whose members include world top-notch sailors Jochen Schuemann, John Cutler and Rod Dawson, saw the coming left shift and strategically placed the TP52 boat, rounding the top mark 30 seconds ahead of second placed Matador. The Swiss team could feel the breath of the Argentineans on their back but kept a comfortable lead, crossing the finish line 28 seconds ahead of them. 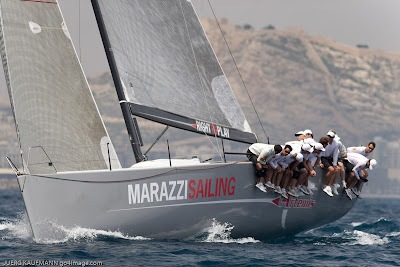 Flavio Marazzi, Helmsman MarazziSailing: “We couldn’t have started the Medcup in a better way. I’m very lucky to be surrounded by a good team and have a boat that sails well. We have shown that we are absolutely not a “B team” and we have all it takes to be one of the fleet’s top teams. The key to today’s success was that all decisions were very good. Although we had a bad start, we tried hard and made the best of it. We picked the good shifts, we were on the side with more pressure, teamwork was nearly flawless and the end result was good. Helming a TP52 is in fact easier for me, as it takes a lot of the work off my back. I’m used to taking all the decisions while on these boats the rest of the team takes the tactical decisions and I concentrate on my steering. 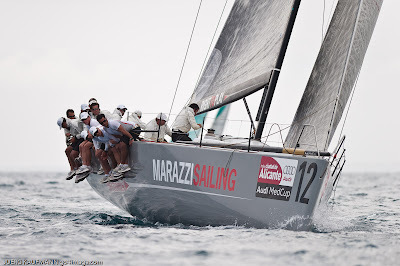 Jochen Schuemann, Tactician Marazzi Sailing: “Winning the opening race of this event was the best possible start. For the first time ever we are the overall leaders of the Medcup. The result was not beginner’s luck. We got a little bit lucky but we used all opportunities we had in this very shifty and changing breeze. We sailed a very good race after the start line. The start was not the best we could have but afterwards with a few tacks we were possible to sail our own race. We stayed on top of the situation both upwind and downwind. It was not an easy job but it was nicely executed by the entire team.